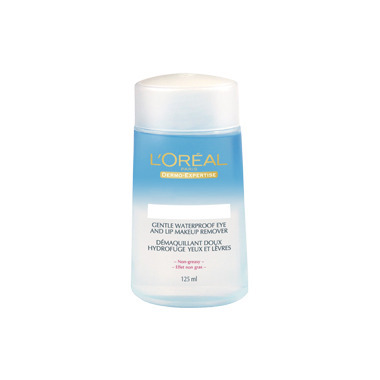 Eye Makeup Remover Waterproof removes eye makeup instantly with a gentle, oil-free formula. Cleans delicate eye area without leaving a greasy film. Dermatologist-tested and safe for contact lens wearers. Gentle, oil-free formula cleans your delicate eye area without leaving a greasy film. Love it! it is a good product for senstive eyes, does a great job! Really like this product. It was provided at a B and B that we stayed at recently and I was very happy it was. My eyes are quite sensitive and most products I have used in the past have been irritating, but this one does a great job of removing the makeup and leaving area feeling moisturized without any stinging. Enfin! C'est le seul dÃ©maquillant pour les yeux qui ne me donne pas d'allergie et qui ne me brÃ»le pas les yeux . Juste pour cela je vais le racheter! A great make-up remover. Takes it all off leaving well moisturized eyes. Love it. I love this remover. It's the best one I've found to remove my mascara, and leaves my eyes feeling moisturized. Takes off waterproof eye makeup well. I am sensitive to a lot of makeup removers, this formula never seems to bug me. Pricier than many other products out there, but worth it. A friend recommended this to me and she has tried many. Does not remove as quickly as I would like. I have to rub (not good) or let it stay there a while before it comes off. I agree with the previous posts about the lid. Hurt my fingers trying to open it a few times. Product is above average quality 3.5 stars (no half star available) but will try something else once it's finished. I agree with Sandra's review. This is a great product, but the packaging leaves much to be desired. A bit pricey but well worth it. Never leaves my eyes feeling dry. Takes off all traces of eye makeup, including waterproof types. Works great for lipstick too, especially the ones that tend to stain. I'm giving it 5 stars for the product but 2 stars for the packaging. No matter how many times you open this thing, it never gets easier. By the time you fight to get it open, you have to shake it up again. Always frustrates me.